including a diverse cast that underscores the story’s universality. Review: When I saw the cover, I wondered what angle Gareth Hinds had as he crafted this adaptation. Was this going to be a West Side Story type? Hinds definitely meddled with the culture of the Montagues and Capulets, but otherwise, he left things alone for the most part. Other than omitting lines, Hinds stayed close to the original text and he kept the setting in historical Verona. He explains at the beginning in a note to the reader, “I chose to cast my retelling of Romeo & Juliet with multiracial characters in order to reflect how universal this story is. It is not a statement about racism or racial conflict.” There is no alteration to the storyline as a result of this cosmetic change. If you could not see the illustrations and only heard the text, you would have no idea that Juliet’s family is Indian. It made me wonder if this graphic novel could ever be made into an audio book because the pictures add so much to this adaptation. The illustrations allowed for a bit more personality to be shown with the characters and of course inserted cultural identifiers. It also allowed me to keep the names straight from the very beginning since the cast of characters included pictures. I have read Romeo and Juliet at least five times as a play for classes or for fun. What I loved immediately was the novelty of reading this story as something other than a script. With the illustrations, stage directions are unnecessary and names aren’t required along with every bit of the dialogue. The text flows more easily this way. He also kept the clothing of the families color coded. The Montagues are wearing shades of blue and the Capulets are in various shades of orange. This made the relationships easier to follow especially during the action scenes. The graphic novel format is one step closer to seeing the play acted out. This adaptation will be very accessible for the reluctant Shakespeare reader whether they are a young adult or a not so young adult. As Hinds pointed out, he wanted to show that this is a story that transcends cultures. Star-crossed lovers can be found anywhere and anytime. Mixing up the culture a bit certainly does help demonstrate that everyman quality. I wasn’t sure how to take that though. It seems to be an example of the “casual diversity” that Betsy Bird spoke of recently. It’s not an issue in the story, it just exists. But it makes me wonder. Are cultures that easy to swap out and should they be? In this instance, as an illustrator he is adding diversity to a text that he didn’t want to alter. It also reinforces his theory that this tragedy could happen to anyone regardless of religious background, skin color, culture or age. For Romeo’s family, skin tone and hair styles were basically the only racial or cultural markers. They appeared to be of African descent. What I appreciated was that Hinds did not have everyone in the family look pretty much the same. There is a wide variety of body types, faces, and hairstyles. He provided diversity within the culture. With Juliet’s family, Hinds included a few more clues beyond skin tone and facial features, but this was mainly in the area of clothing. The most obvious being that Capulet wears a Sikh turban and Lady Capulet has a head scarf, but there were others. The only truly jarring note was the mishmash of modern and older dress. The younger characters like Juliet were sometimes in more contemporary clothing like her short skirt. It would jerk me out of the story more than any of the other things that were going on in the illustrations. That the time periods of the costumes were not matching was a bit disconcerting. It didn’t stop me from enjoying the story though. Overall, the illustrations were rich and truly brought out the emotions of the story. I know that I would have loved to have this as an option when I was first reading Shakespeare as a teen. It will likely draw new readers to Shakespeare. 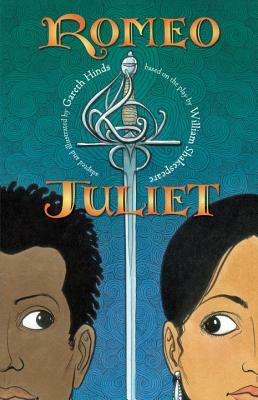 My Recommendation: If you are a graphic novel or Shakespeare fan, I would get this one soon. Otherwise, I would still recommend that you check it out sometime. It is a gorgeous way to experience Romeo & Juliet. You may preview it here.